My husband is an amateur astronomer and we are fortunate to have great dark skies at home and at other Western Slope venues. Most people assume that we use telescopes for observing and ask how many we have and what kind. We explain that we have several telescopes, but some of our favorite viewing is with binoculars. 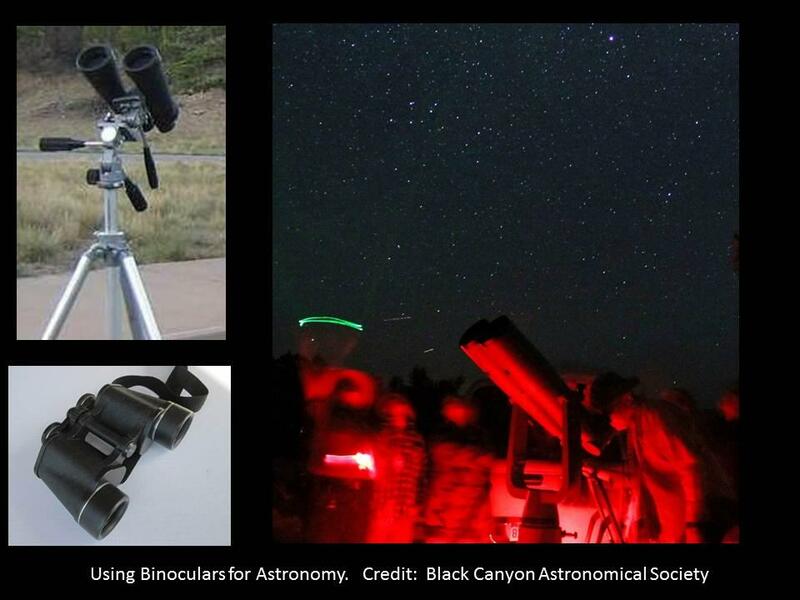 We often use binoculars when we do public astronomy events. Granted, our largest pair weigh 150 lbs. and are 3 feet long, but we also have a variety of smaller binoculars that give wonderful views. There are many virtues to using binoculars for astronomy. Foremost is that many people already have them for terrestrial viewing, so the learning curve is minimal. Because binoculars are easy to operate and have a wide field of view, people find them easy to point and focus. This makes them great for finding and learning about objects in the night sky. Many people comment on the “3-D” or “space-walk” effect that comes from viewing with both eyes. I have actually had visitors at public events experience the “wow” effect from viewing not only through our “big” binos, but from using a more modest pair. Not all binoculars are created equal, especially for viewing the night sky. A small pair can be hand-held, but a larger pair requires a sturdy tripod and a way to mount them. Various options for mounting and optical specifications can be found on the internet. The sky is a big place, so binoculars with a 5-degree or wider field of view makes it easier to scan for and find objects. Sky charts, books and various apps can help you locate astronomical objects on any given night. As with telescopes, your binocular’s optics, size, and field of view determine the best things to observe. A great object to start with is the Moon and its various phases. Learn what planets are in the sky during the evening as it gets dark, and later begin searching for other targets like star clusters, double stars, nebulas, and galaxies. You will be amazed how much you can see with binoculars! Craters and rays on the Moon, moons around other planets, colors of stars, and glowing dust and gas around star clusters will be apparent. The Milky Way becomes stars, not just clouds, and dark nebulas stand out in contrast. All with a pair of binoculars! Sometimes, in astronomical viewing, two eyes are better than one! Western Slope Skies is produced by members of the Black Canyon Astronomical Society. This episode was written and recorded by Joyce Tanihara.